So I wanted iTunes 10 back. I thought it would be fairly straightforward to downgrade – just uninstall iTunes 11 and then install iTunes 10.7. The basic reason for this is that iTunes makes little notes about the version you are using all over your system. It won’t let you downgrade because all these notes have no instructions built in to cope with that. Apple doesn’t expect you to want to downgrade so that eventuality has not been prepared for. 1.) A message about an unknown error (-42408). 2.) A message about being unable to connect your iPhone and needing you to restore it [the iPhone] to the factory settings. I know that there are all sorts of solutions and advice and tips and such available online (because I tried a lot of them). But as usual I couldn’t seem to find one complete comprehensive guide which covered all the information I wanted (I’m sorry but I do, in fact, really want all the bells and whistles, and my hand held too, thank you very much). So in view of this I have written my own guide to downgrading from iTunes 11 to iTunes 10.7. This is a step by step of exactly what worked for me, including all the details I couldn’t find and wished I had when I was downgrading. As always this is a comprehensive guide so some steps may seem obvious but I like to be thorough. Oh, and just so you know, I am using Snow Leopard (OS X 10.6.8). This is a downgrade to A PREVIOUS VERSION of your iTunes and in order to avoid all errors you will also be restoring your iTunes Library to a previous state. Therefore anything you have added AFTER upgrading to iTunes 11 will not be in your downgraded iTunes Library (because it did not exist at that time). The items you have added after upgrading to iTunes 11 must be added manually (in iTunes go to File > Add to Library… > and select your music folder/s). If in doubt back up first! Right. Let’s rock and roll. The iTunes folder you are looking for will also contain a file in called iTunes Library.itl and a folder called Previous iTunes Libraries which will be important later. Even if you don’t back up anything else, I would strongly advise backing up the two items above anyway. Just in case. Step 1. Uninstall iTunes 11. 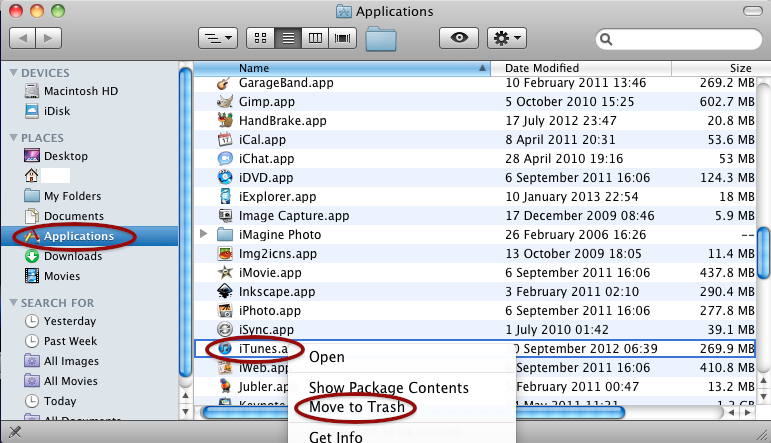 To do this merely open your Applications folder, find the iTunes app and either right click and choose Move to Trash or just drag the icon to the Trash. You will be asked to confirm this if you are not the Administrator but just type in your details and press OK.
Congratulations! You have just kicked iTunes 11 back to depths of trashdom from whence it came. Pacifist is shareware. However as long as you are happy to put up with the constant nagging about paying for the program you can use it as freeware. In any case you can just use it this once and then delete it if you want. You actually don’t need to install Pacifist in the conventional way. 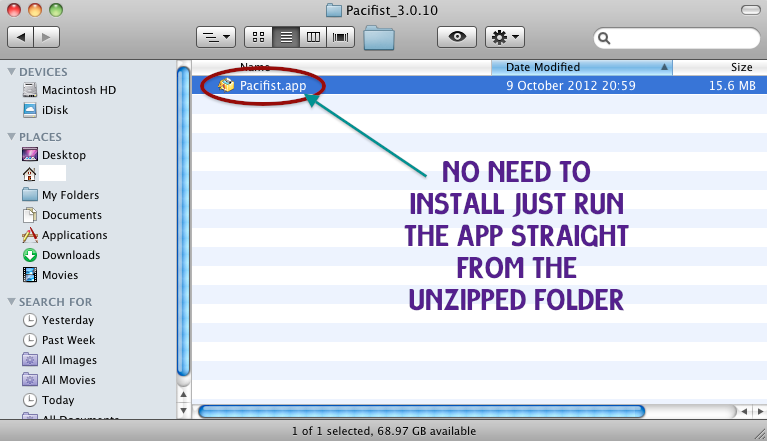 You can run it simply by unzipping the Pacifist zip file you downloaded earlier, then opening the folder and simply double clicking (or however you have set your programs to open) on the Pacifist app icon. But I will explain this again in Step 3. Now Pacifist is ready to go we can start installing iTunes 10.7. And now onwards to glorious iTunes 10! 1.) Start Pacifist by going to the folder you unzipped and double clicking (or click or however your Mac is setup) on the Pacifist app icon. Because Pacifist is shareware, when you start the program it gives you a little message to say that it is shareware and some other information. In order to use it for free you will have to wait for the countdown to complete before continuing (unless you want to register). So wait and then continue by clicking Not Yet. 2.) 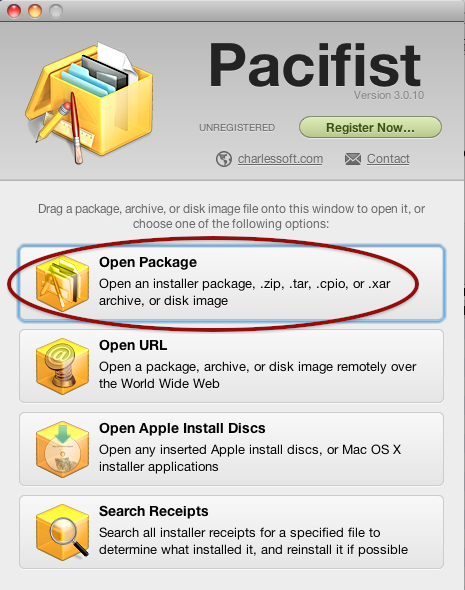 When Pacifist is up and running click on the Open Package option. 3.) 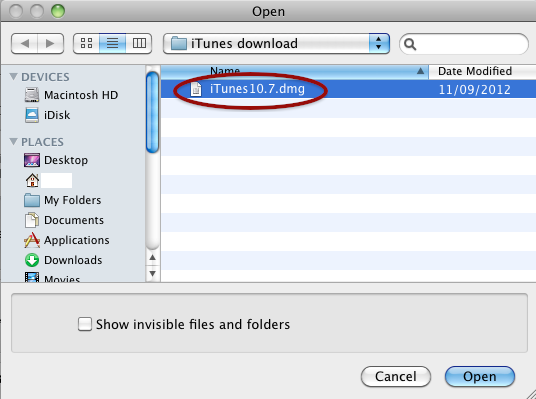 Locate your iTunes 10.7 dmg which you downloaded earlier and click Open. 4.) Pacifist will then show you the package contents. Make sure you select everything! NOTE: It is actually easier to just click Contents of iTunes10.7.dmg as this should select everything within the package. 5.) Click the Install button (orange arrow) located on the top left of the toolbar at the top. If you feel uncertain at this stage by all means cancel and backup whatever you feel is necessary. As I say, I didn’t have any issues (well, I haven’t noticed any) but you should do what you feel is best. 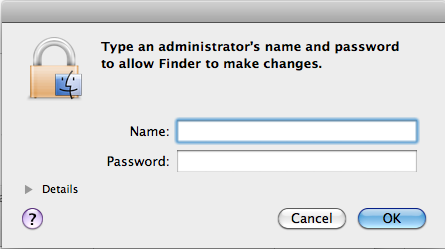 When you are ready, tick the Use Administrator Privileges box and then click Install. Depending who you are installing as it may ask you for your Admin username and password. NOTE: It is important to tick this box as otherwise Pacifist will not be able to access all the silly notes that iTunes has made about the version you should be using and you may have problems with the installation. 7.) During the installation Pacifist will ask you about every single file it has to replace. Make sure you click Replace for every message. About halfway through you get some messages offering an option to Update as well as the option to Replace. I clicked Replace (NOT Update) here. 8.) When everything has finished you can close Pacifist. 1.) 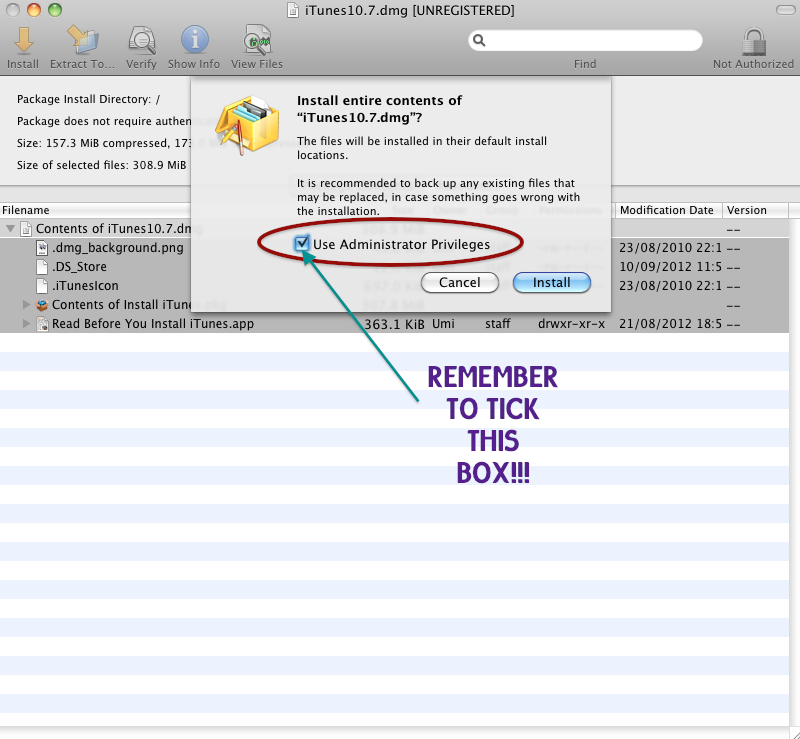 Locate your iTunes folder, and within it locate your iTunes Library.itl file. Either way you should keep this file, and keep it safe in case of emergencies. 3.) Go into your Previous iTunes Libraries folder. All the files in this folder are iTunes libraries which are usually created when you upgrade although they can also be created manually. You should leave the original in the Previous iTunes Libraries folder just in case. Now fire up iTunes and hopefully you have your lovely user friendly iTunes 10 back without any errors or iPhone syncing problems whatsoever! Hooray! To all fellow haters of iTunes 11, I urge you to return to iTunes 10! You can’t imagine the satisfaction and relief you will feel once you successfully downgrade and see that familiar practical convenient aesthetically pleasing interface once again. And there was much rejoicing! Hooray! well, that sounds cool, getting back to itunes 10.7! erm… is there meanwihle a german version of your description? if not, okay – but if, hurraaah! Thank you for letting me know this worked for you. And for an iPod. This is good to know! Hey, I stumbled upon this article while trying to sort out a problem I’ve gotten with iTunes since I downgraded. Basically, iTunes won’t recognise my iPod Classic (6th Gen, almost brand new). Now the annoying thing is when I plug my iPod into my computer iTunes will pop up, or even open if it’s not running already. My iPod also appears in finder as “Adam’s iPod” and I can put files on it as if it’s a disk. So iTunes and my computer know that there’s an iPod plugged in, but iTunes refuses to display it as a device. It’s a mac formatted iPod, and I know it’s an iTunes related problem because I created a new user, installed iTunes 11 again (ugh) and it recognised my pod. I’m running OS X Mavericks. Any thoughts? 1.) If you are running Mavericks it may not be backwards compatible so you may actually need to have iOS 7 on your iPod to get it to recognise the device. 2.) As far as I can tell, iOS 7 is only compatible with iTunes 11.1 and above, so perhaps make sure you have the latest iTunes on your system. 3.) A lot of Mavericks users suggest that Mavericks forces you to use iTunes 11, so perhaps it can’t cope with earlier versions? If you uninstall iTunes again (although I guess you’ve tried this once) and do a clean install of iTunes 11.1 using Pacifist something may change. As I say I do not have an iPod Classic and I don’t have iOS 7 or Mavericks, so these are just suggestions. Let me know if any of these work for you. 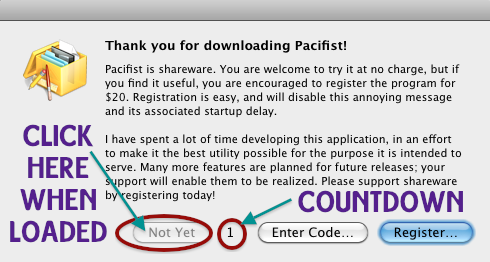 I am just wondering why you need to reinstall itunes with Pacifist? isn’t it enough to trash all Itunes files and then just reinstall Itunes by doubleclicking the .dmg installer ? or is using Pacifist the trick for avoiding the dreaded -42408 error? You would have thought that would be enough, but sadly no, Apple makes it far more complicated. That was the first thing I tried. It didn’t work. Due to the problems I mentioned above, only by using Pacifist can you successfully bypass all the downgrade issues. I simply want to thank you for spending the time and energy to post this extremely useful guidance! It solved my “Unknown error -42408” problem nicely, and I really appreciate it. Thank you, and as Paul Van Name said “this is the single best advice I have ever read and instituted. Clear, concise and accurate.” I couldn’t have said it better myself. Glad to be back in ’10 World’! I simply wish to say that this is the single best advice I have ever read and instituted. Clear, concise and accurate. Thank you…..thank you…..thank you. Hi, Thank you for taking the time to leave a positive comment! Hey there! Sorry for the wait on a response. Actually wordpress filters it all for me into spam and comments so I don’t have to check it all. I just moderate what wordpress actually puts in to my comments box. I should probably check my comments box more often though… and possibly check my spam box once in a while in case real comments are ending up in there…. Well, the downgrade worked, and thank you very much for this post, BUT (and I only realized this at the last second, so it might be best for you to post some sort of disclaimer at the top) it turns out that my most recent ‘Previous iTunes Library’ itl document is 8MB smaller than my current one. As you can imagine, that’s a pretty significant portion of music that iTunes is now not registering. All 800 gigs is still there in the iTunes Music folder, but only half that is viewable in iTunes. What’s your recommendation on the best way to fix this problem? Gotta say, though, seeing iTunes 10.7 again with it’s minimalist, lightning-fast search bar is fantastic, thanks! PS, everything’s backed up, so no worries. I can’t be sure but I imagine that the half of your iTunes folder that has not been recognised is all the music you have added SINCE you updated to iTunes 11. Your previous library file will only include the things you had in your library at that time. So when you downgrade, iTunes 10 won’t know about all the new things you added when you were using iTunes 11. I would say that probably the easiest thing to do is just re-add the rest of your music manually (iTunes > File > Add to Library and then select your iTunes folder). I’ll try and add a note somewhere in my post. Here’s to hoping Apple get their act together for iTunes 12! !